Sixty-six readers love this post. DrinkWire is Liquor.com’s showcase for the best articles, recipes and reviews from the web’s top writers and bloggers. In this post, Beth Cowie offers a rum recipe. Here is a cocktail that would be suitable to sip on a Caribbean Island or an island bounded by the Hudson and East Rivers. It's sort of a Manhattan with dark Jamaican rum in the place of whiskey (plus a couple of other modifications). We like our Manhattan "perfect" - so we made this Manhattan variation with dry vermouth and Grand Marnier taking the sweet vermouth spot. We also decided that (just like with our Manhattan) cherry bitters work well here. The rum we chose is Appleton Estate 12 Year Jamaican Rum. This makes for an easy swap with the bourbon since it's a smooth blend of dark rum aged in American oak barrels. From Jamaica Bay you can see part of the Manhattan skyline. Perhaps when you drink our Jamaica Bay cocktail you'll be reminded of Manhattan, but you're also going to get a sense of that lovely island in the Caribbean that produces some very nice rum. Put all ingredients into a mixing glass with ice cubes. Stir for 30 seconds. 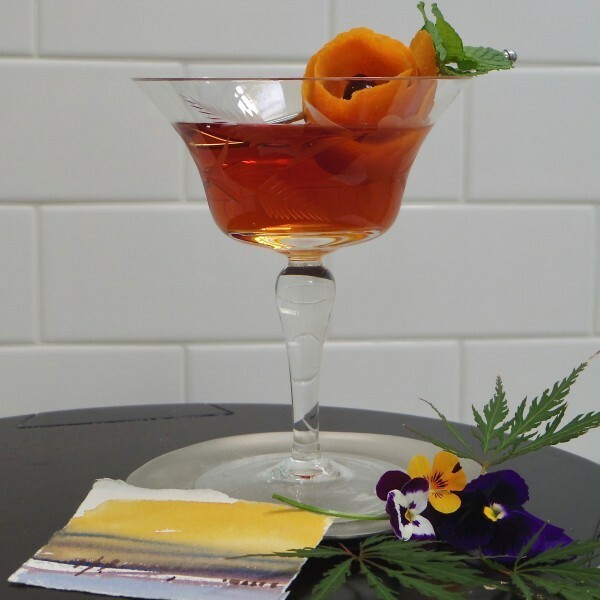 Strain into a cocktail coupe and garnish with an orange peel and a brandied cherry.